This is a great before and after story of a guy who took advice and got his label reworked. Still a 4 at the end of the day, but this is definitely a sauce to watch. 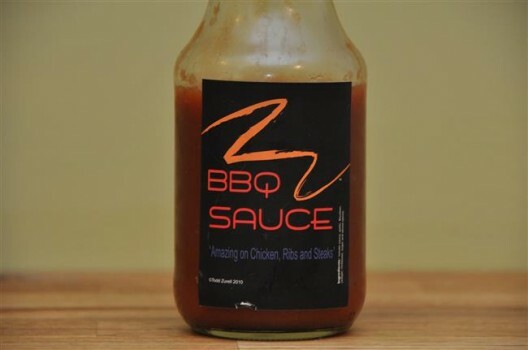 The name Z BBQ Sauce comes from Todd Zurrell’s last name. 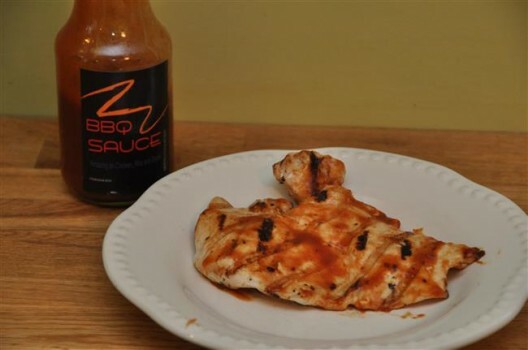 Mr Z has got a spicy bourbon BBQ sauce that tastes great but could use a few packaging touch-ups to really shine. The sauce flavor is reminiscent of the tangy Stubb’s Mesquite Bourbon variety, but better. Flavor is nice for folks who like Stubb’s style BBQ sauce (tangier, not so sweet, and a little thin) compared to the Sweet Baby Ray’s KC style sauce (thick and sweet). Consistency – just right for this style of sauce. The tomato paste base versus ketchup probably had a lot to do with this. The specks from red pepper flakes and cayenne pepper are swimming around the bottle, probably drunk from the bourbon. Ingredients – great. Very few ingredients and although this bottle lacks nutritional information and a UPC symbol, I believe it’s an all natural, HFCS-free sauce. Heat – Just right for a sauce that doesn’t market itself as being hot. Once you start getting hotter and spicier, you really need to tell people what to expect on the label so they aren’t surprised and upset by sneaky heat. Label/Appearance. The sauce is clearly in an early stage, but I’d recommend changes to the label and logo to make this stand out. First, I’d go through the process of getting the UPC and nutritional info on the bottle. This will cost you a bit (to buy your own UPC bar code, you need to become a GS1 member, which costs $750, followed by an annual fee of $150. A bar code will then be assigned to you. For those who can’t afford GS1 membership, some companies resell bar codes at around $80 for the first code, and $35 for subsequent ones). Hard to read the name, a bit generic looking. 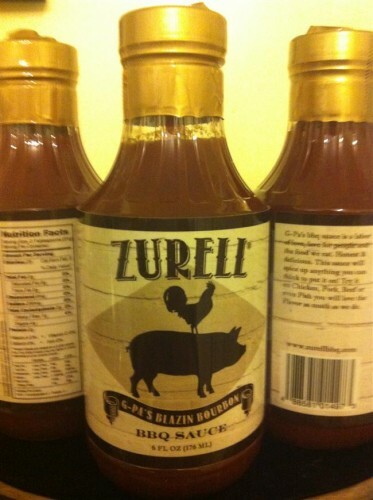 Would recommend making the Z easier to read and potentially calling it Zurrell sauce to give the sauce more character. Copywriting needs to be more specific – need to mention Bourbon somewhere and call out where the product really shines, not as an all purpose sauce. Currently it says “Amazing on chicken ribs or steak” On the label, tell us why its amazing? The heat, or the flavor or the consistency? Z BBQ has a lot of potential. Inside the bottle it’s a 4 almost a 5. Outside the bottle elements are a 3. A few touchups on the outside can help this become a very successful sauce. Don’t be afraid to try something different. Flavor is nice for folks who like Stubb’s style BBQ sauce (tangier, not so sweet, and a little thin) compared to the Sweet Baby Ray’s KC style sauce (thick and sweet). Definite bourbon flavor. Consistency – Very good. The tomato paste base versus ketchup probably had a lot to do with this. The specks from red pepper flakes and cayenne pepper are swimming around the bottle, probably drunk from the bourbon. Ingredients – great. Very few ingredients (tomato sauce, garlic, bourbon, vinegar, molasses, sugar and secret spices) with no noticeable bad stuff. Heat – Just a touch to surprise your mouth. Just right for a sauce that doesn’t market itself as being hot. Once you start getting hotter and spicier, you really need to tell people what to expect on the label so they aren’t surprised and upset by sneaky heat. Label is now clear and factual, but a little bland – the gold wrapping on the top almost makes it look old. 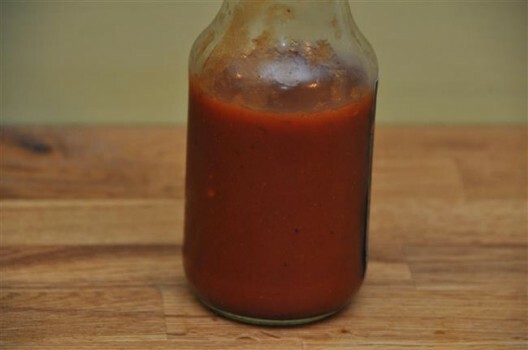 Don’t be afraid to try something different – look at design ideas from innovators in the craft beer / hot sauce industry because most BBQ sauce bottles are pretty boring. The sauce is great and has a lot of potential. If Todd sticks with it and sells and markets his sauce as well as he makes it and labels it, he could be going places fast. Haven’t had the sauce, but the label change really makes a difference. The ingredients list is what appeals to me the most…less is more! Gonna have to give this one a try, agree that Less is more in the ingredient department!! Looks like a great change in the packaging. I prefer a tangy sauce so this might be right up my alley. Sounds interesting, going to have to check it out!